Raspberry Pi + MeArm + Azure automatic fish feeder. Going for a three weeks holiday. Who is going to feed my fish? I can ask friends or neighbors to drop in every 2, 3 days (safest way) or do the 7 days feed block * 3 times or buy a ready made auto feeder, checked a few selling on Amazon which doesn't have everything I need. take a few pictures after the each feed to prove it does work. live cam streaming - this is something nice to have. Software: Python code on Pi to control the arm positions and take pictures. An web app deployed on Azure to act as the brain to control when to feed, when to take pictures etc. Pi is constantly sending http request to the web app to check if need to trigger a feed action or take picture action. 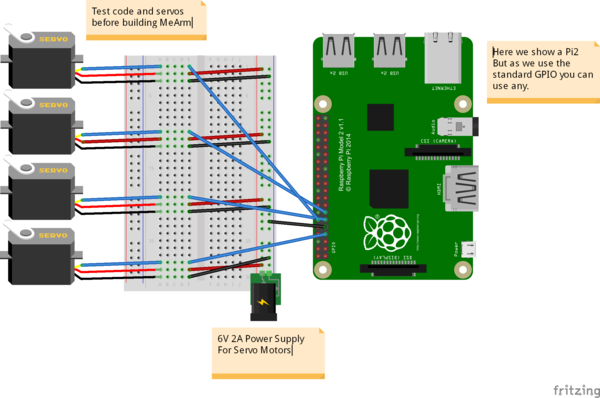 Follow the instructions here to build a MeArm, wire it to your Pi and build the servo control driver kernel (Thanks to richardghirst 's brilliant code). You can skip the last python code section in the instruction as we are going to write our own client control code. Download the web app code from here (.net core + angular2), deploy it to a web host for example Azure free web app service. Web app screen shots as below on an iPhone. Run the Python code in step 3. Last but important, if you do follow this for your own holiday feeding solution, do have a backup plan, or if anything goes wrong you will be watching your dead fish in live streaming.